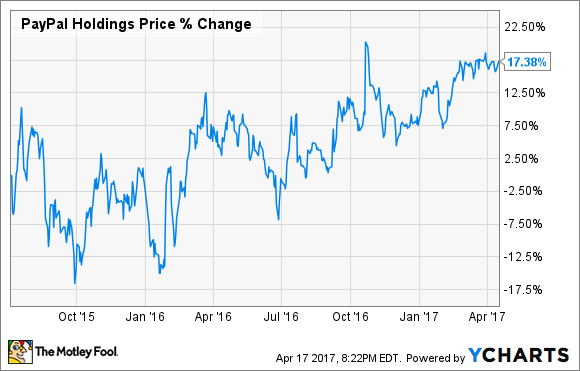 5 Things You Didn't Know About PayPal Holdings Inc. This payments company traveled a long and winding road to success and profitability. Most consumers know PayPal Holdings Inc. (NASDAQ:PYPL) as the digital wallet they use to make purchases online. Other consumers' thoughts will immediately turn to online retailer eBay Inc. (NASDAQ:EBAY), where PayPal is almost universally used as the payment platform of choice by buyers and sellers. For investors, PayPal's history is a bit more complicated. In 2002, the company went public. A few short months later, it was acquired by eBay, after PayPal almost cannibalized its checkout page. From that moment until the summer of 2015, if investors wanted exposure to PayPal, they had to invest in shares of eBay. Since being spun off, PayPal shares have dipped, spiked, and ultimately meandered to little more than a 15% gain. Peter Thiel met Max Levchin after giving a presentation at Stanford University in the late 1990s. Soon thereafter, Levchin approached Thiel about starting a company that would produce encryption software for handheld devices. The company they founded, called Field Link, was established in Silicon Valley. The encryption idea soon fizzled and the company would make the first of what ultimately proved to be several name changes and pivots in focus. Thiel and Levchin refocused their efforts on the booming Palm Pilot business and renamed the company Confinity. The new company was to launch a platform called PayPal that would allow Palm Pilot owners to transfer money to other Palm Pilot owners. To demonstrate PayPal's capabilities, Nokia Ventures, the venture capital arm of Nokia, transferred three million dollars in investment funds to Thiel's personal Palm Pilot. According to this quaint 1999 Wired article, the process took all of five seconds. The Palm Pilot idea inevitably fizzled too. Even during its heyday, only a small minority of U.S. consumers owned any type of handheld personal assistant device. Fortuitously, it was just at this time that online commerce began to really take off. Confinity devised a way for users to send money via email, creating an immense advantage over other digital-wallet start-ups of the time. Some digital wallets (e.g., Beenz.com, Flooz.com) were entirely based on new and unproven digital currency, while others (e.g., CyberCash) required pre-funding. It is not a coincidence those start-ups are long defunct. Confinity allowed PayPal accounts to be linked to existing bank accounts, so no pre-funding was required. And since it relied on the U.S. dollar instead of gimmicky cybercurrency, consumers placed more trust in the system. Combined with its inherent convenience over writing checks or sending money orders, Confinity's PayPal service proved to be very popular with early e-commerce consumers. PayPal's services were very popular with early eBay users. Image source: eBay Inc. In March 2000, Confinity merged with X.com, a company Elon Musk had co-founded that focused on online banking solutions. Musk believed so strongly in the flagship service that he renamed the company PayPal in 2001. After the company began receiving lots of positive feedback from eBay customers, the company shifted focus again, this time to the growing e-commerce market. Musk aggressively marketed the service and offered small cash giveaways to new customers. Due to the marketing push and PayPal's advantages over its competitors, account growth exploded. From January through August 2000, PayPal accounts grew from 12,000 to 2.7 million. Musk would not remain the CEO for long. He believed the company should move from a Unix to a Microsoft platform, but he lost the battle and was replaced by Thiel shortly thereafter. 4. The PayPal Mafia: The world's greatest professional network? The "PayPal Mafia" is a term used to affectionately describe the pre-IPO PayPal team in California; it was estimated by Thiel to include about 220 people. Members have gone on to found several disruptive start-ups valued at over a billion dollars themselves, including Tesla, LinkedIn (later acquired by Microsoft), Palantir Technologies (private), Yelp, YouTube (acquired for $1.65 billion by Google, now part of Alphabet), SpaceX (private), and Yammer (acquired for $1.2 billion, also by Microsoft). I prefer the word friendship to networks, and I think the critical piece was that some incredibly deep friendships were forged. I think that is what's very underrated in our world today. As one of the first viral apps, PayPal played a crucial role in shaping Silicon Valley. Users could send money to nonusers through the platform, but before recipients could claim the money, they had to open their own accounts. It was one of the first companies to give users the option to embed a widget it provided; early eBay users could embed PayPal's logo onto auction pages. And PayPal broke the product-cycle scourge by releasing updates as they became available, instead of at specified intervals. The investing lessons learned by reviewing PayPal's long, winding road to success pertain to far more than just the future of the company. First, it is extremely important, especially for young tech companies, to be able to pivot an entire company's focus when necessary. PayPal would have likely been nothing more than a footnote in the dot-com crash if it had kept its focus on transferring money between Palm Pilots. Second, a company's culture is important. While there are many different ways a company can cultivate a good workplace, it is clear PayPal's early days relied on relationships rather than headhunting to find the right people to fill roles. Finally, the last lesson one can learn from PayPal's journey: If you need a job, it doesn't hurt to know someone who's a member of the PayPal Mafia.